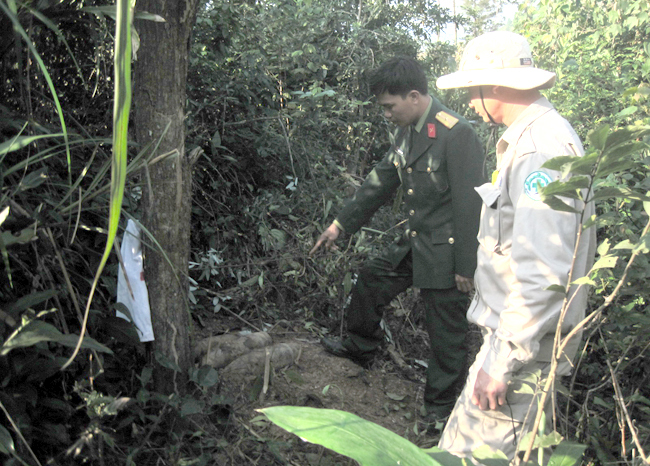 Dakrong, Quang Tri (26 Feb 2015) – A UXO discovery reported by an ethnic Van Kieu hunter on Wednesday resulted in eight artillery shells being safely removed from a hill half a kilometer from Route 9 – a major east-west artery today, and part of the Ho Chi Minh Trail during the war. A Project RENEW EOD team safely moved the shells to the central demolition site for safe destruction. With the Lunar New Year over, 39-year-old Ho Van Giai, a native of Khe Ngai Village in Quang Tri Province’s Dakrong District, went into the forest to search for bamboo rats for sale. These large, slow-moving rodents that live and forage in extensive burrow systems, feeding on bamboo, have recently become a specialty in local restaurants. Finding a suspected lair, Giai started digging. To his surprise he found three items of wartime munitions. Giai stopped digging immediately and picked up his cell phone to call Major Nguyen Van Thanh, who Giai knew was working at the district military command. Military Liaison Major Nguyen Van Thanh showing the location of UXO to Project RENEW’s EOD Team Leader. “I was afraid that children might tamper with these dangerous munitions so I called Mr. Thanh for his help,” said Giai. 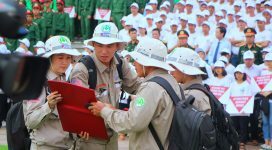 Major Thanh acts as military liaison for Project RENEW in Dakrong District. 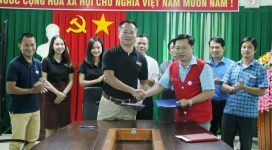 Major Thanh immediately called Project RENEW’s hotline telephone number and coordinated with RENEW’s Quick Response Team No. 3 which was operating in Cam Lo District, about 40 km away. After about an hour the team arrived and Thanh directed them to the location where the Van Kieu tribesman had unearthed the UXO. After walking half a kilometer from Route 9, up steep and rocky inclines, team members arrived at the spot. Using detectors to check the entire area, the team found five more items in addition to the three shells unearthed by Mr. Giai. EOD team member fencing off the munitions before transporting them to Project RENEW’s Central Demolition Site for safe destruction. 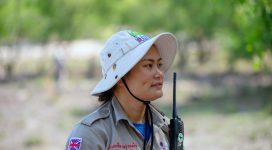 “So a total of eight projectiles have been found today, all of them unexploded and dangerous if someone tampered with them,” summarized Team Leader Duong Duc Tam. There were seven High Explosive (HE) projectiles and one High Explosive Squash Head -Tracer (HESH-T) projectile found. “These projectiles are safe to remove so we will transport them to our Central Demolition Site (CDS) for later destruction,” Tam said. Ho Van Giai did not catch any bamboo rats yesterday but he said he was happy that he had contributed to safe removal of UXO from his village’s forest. Wednesday marked the first working day for Project RENEW’s operations teams after the Lunar New Year holiday, and it was a good beginning. 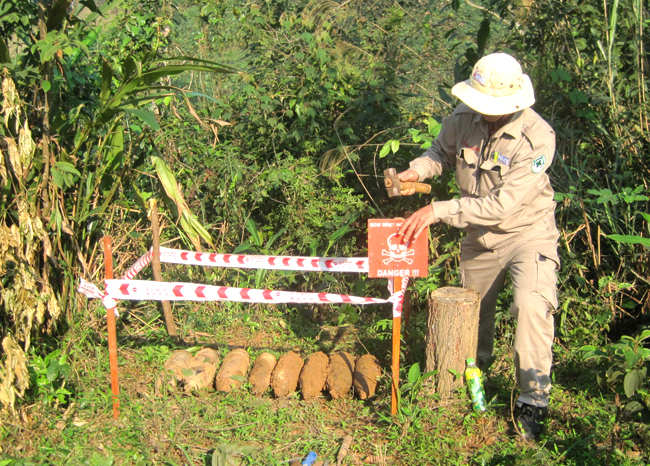 In Trieu Phong District, two other EOD teams responded to seven tasks and removed five items of UXO to RENEW’s CDS for destruction, while they safely destroyed five other items in place. Meanwhile, four Cluster Munitions Remnants Survey (CMRS) teams resumed their technical survey work at four sites in Cam Lo District, completing an area of 122,500 m2 and safely destroying 13 cluster bombs and one UXO.